Kentuckians are making plans to join a massive march in Washington DC this spring in support of clean energy jobs, a just transition for workers and communities, and climate action. This year it is clear the march will also be an important show of resistance to attacks on the laws and public agencies charged with protecting our land, water, air, health and climate. The People’s Climate March will take place in DC on Saturday, April 29, 2017. The march is timed to fall near the 100th day of the new administration. It is being organized by a broad cross section of labor unions, students, faith organizations, indigenous groups, civil rights organizations, environmental justice groups, and environmental and climate organizations. 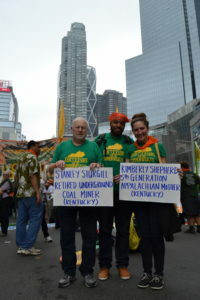 Stanley Sturgill, Sean Hardy, and Kimberly Shepherd at the People’s Climate March, September 2014.